Art Supply Review: Viviva Colorsheets — Sadie Saves the Day! 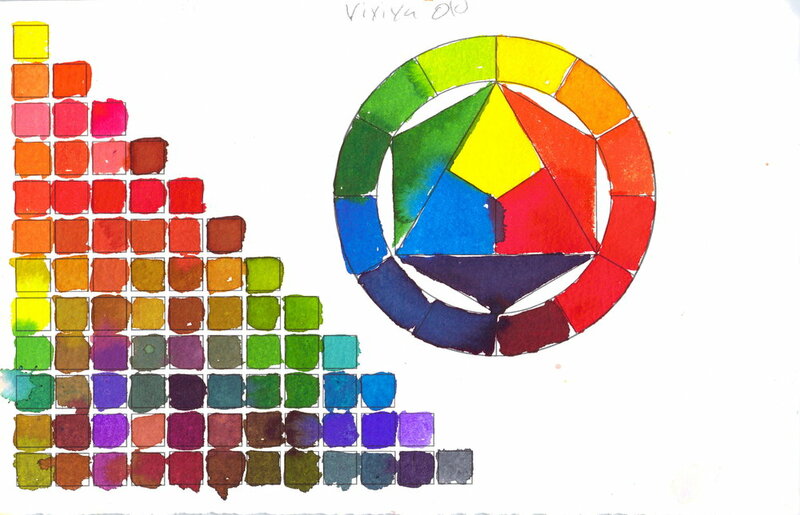 I first heard about Viviva colorsheets last year when I watched a video from StudioBAS. The colors were amazingly vibrant and saturated, so I knew I had to try them! I wrote to Rohan and Aditya, who created the product and they sent me a sample. At that time, they were planning on doing a kick starter in October 2016, and they had a totally different design for the product. After sending out more samples and getting feedback, they have completely revamped the product, and I have to say that is a joy to use! As you can see, both the old and new versions of the product are completely transparent. 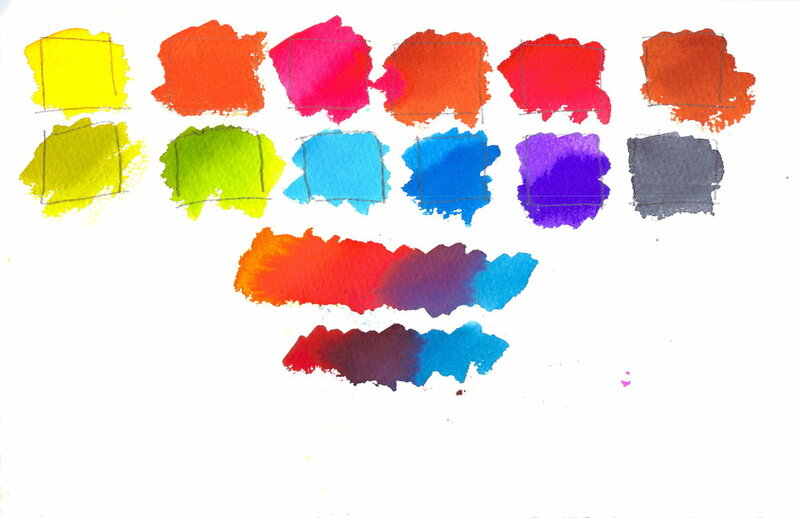 The colors are extremely vibrant, extremely saturated, and have no granulation. The problem is that the colors in this set are not very varied. Eight out of the 16 colors in the new set are some kind of red/orange/yellow color. None of the Reds are particularly cool. The peacock blue and Persian blue are nearly identical, as are the flesh, chrome yellow, and gold ocher. Crimson and deep pink are only distinguishable in tints, and are the same in mass tone. Just as a note, these colors will stain anything that they touch, possibly permanently. Also, if you get the papers very wet, they will smell a bit. These colors mixed together with absolutely no problem. Since they are dies, they have very good flow, and shoot across the page. Since this is intended as a of urban sketching or plein air set up, it's worth noting that there is no mixing area in this booklet. The majority of these colors jump off of the page very easily. There are a couple that need a bit of scrubbing to be activated. When using a medium-size brush, it looks like it activates a lot of the dye, and I'm a little worried that the color will run out very quickly. I haven't had this problem yet, though. The colors are extremely staining, so it makes it extraordinarily easy to layer the colors. Once a color is put down, it's not going to move. Also, since they are transparent, they build up colors beautifully. As I said, these colors are extremely vibrant! For some people, these might be too vibrant, and it could be difficult making more natural, muted colors with this palette. This is not for somebody who wants serious watercolors all the time. Normally, I would never recommend a product that I was almost certain was extremely fugitive. I don't really like the idea of using lower quality watercolors for sketches and things like that. However, I do love these Viviva color sheets. Why? Because they are extremely portable. I can slip these in my pocket or my prayers and as long as I have a water brush, I have something to paint with. 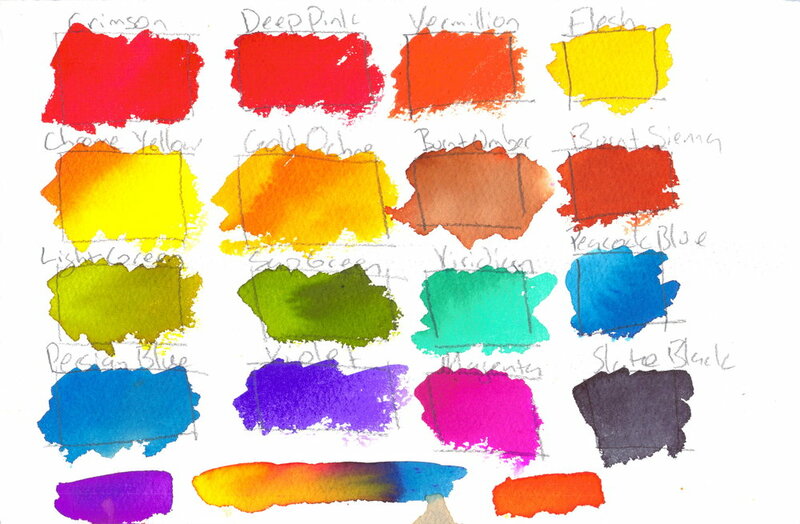 A watercolor field set cannot get any more simple than this! I have several small portable watercolor sets, but this is the one that is always with me. You know how they say that the best tool is the one in your hand? That's how I feel about these. So the Viviva colorsheets are perfect for the person who always wants to be ready to paint, but cannot always spare the room that a watercolor kit might take up.